Objective: There is a significant learning curve to overcome for laparoscopic colorectal resection. For the established general surgeon there are minimal opportunities for obtaining the necessary skills for advanced laparoscopic procedures. Our hypothesis is that the assistance of a MIS trained surgeon facilitates comparable and oncologically adequate laparoscopic colorectal resection when performed by an established general surgeon without formal MIS training. 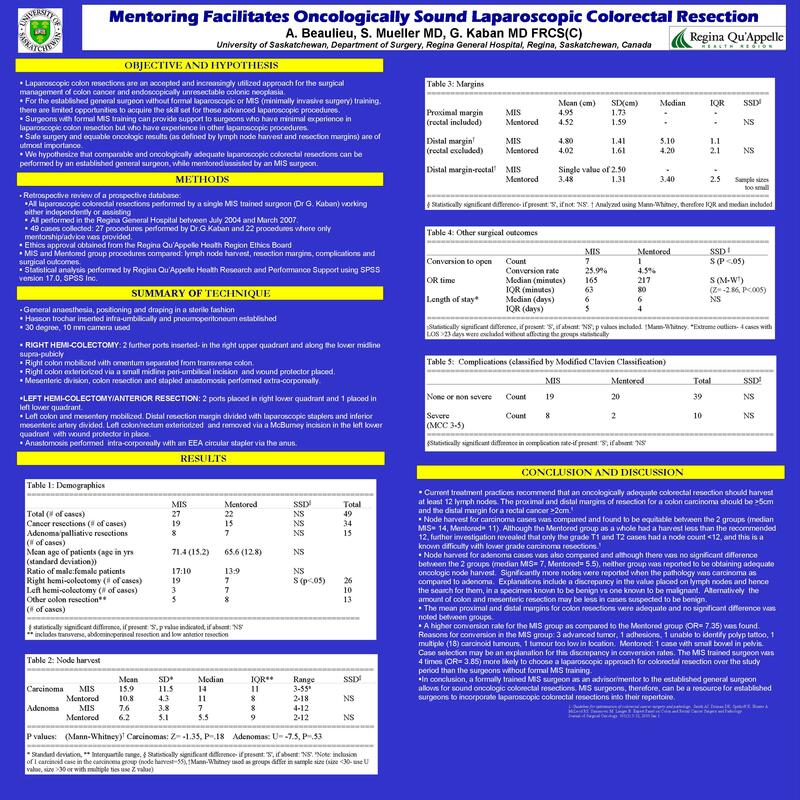 Patients and Methods: Information was obtained from a retrospective review of a prospective database of all laparoscopic colorectal resections for cancer or colonic neoplasia performed by a single MIS trained surgeon working independently or assisting in the performance of laparoscopic colorectal resection in the Regina General Hospital between July 2004 and March 2007. The results of the MIS trained surgeon were compared to those of participating general surgeons where the MIS surgeon acted only in an assistant/advisory role. Complication rates in both groups were classified according to the modified Clavien system and included MIS: grade I= 10, grade II= 4, grade III/IIIa/IIIb= 4, grade IV/IVa/IVb= 4; Mentored: grade I= 2, grade II= 1, grade III/IIIa/IIIb= 2, grade IV/IVa/IVb= 3, grade V= 1. Conversion rate was 25.9% (7) in the MIS group; Mentored: 4.5% (1). There was 1 death (in mentored group secondary to complications from ischemic bowel), and 1 anastomotic leak requiring reoperation (in mentored group). Conclusions: MIS surgeons can be a resource for established general surgeons to incorporate laparoscopic colorectal resections with comparable and acceptable oncologic results.